I stood under the front entrance canopy of the H.E.B. grocery as I watched cold rain pouring onto the parking lot. Slowly moving towards me was a young woman pushing a train of about fifteen shopping carts. 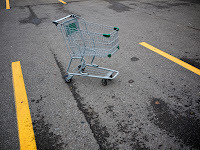 Her head was down as she leaned into the carts, maneuvering them into position. Then she looked up at me and beamed an exasperated smile. After weeks without rain, I get it on my shift! I must look like a mess. This is a hard way to make money! I was sure she didn't know it, but how she responds to a job like this will have a big impact on her life. I've written about about child brain development and about how the developing teen brain is a turning point in a person's life. The discipline and structure imposed by employment can give her goals, a sense of purpose and accountability at a time when her brain is disrupted by spurts of growth and self-management is difficult. Also, it's valuable to gain a realistic perspective on what hard work is and what needs to happen in a successful business. This is crap. I don't have to put up with this. I'm outta here. I had no idea what she was thinking. But I knew that whatever it was, the consequences would not be trivial. Denny, this is a profound insight about an every day event that most people wouldn't even notice, much less remember. Your post is a great reminder that everything we think or do in a given day COUNTS. The cumulative impact of our thoughts and actions creates our attitudes and defines who we become. You notice people, like me. I think we have similar personalities. I was touched by your observation. How profound and inspiring. I hope some of my posts move you as much as yours move me: http://Dr-Rhia.blogspot.com The blog is only a month old; I know my niche but am very unclear about marketing so any advice will be gratefully appreciated.